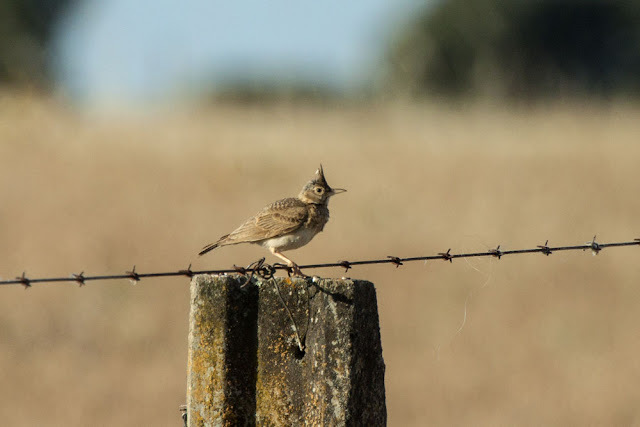 Rob writes: After such a successful first day of birding in Extremadura, I couldn't wait to get back out the next morning so we got an early start. We arrived in the Santa Marta steppe just after sunrise to search for one of my biggest target birds of the trip, Great Bustard. 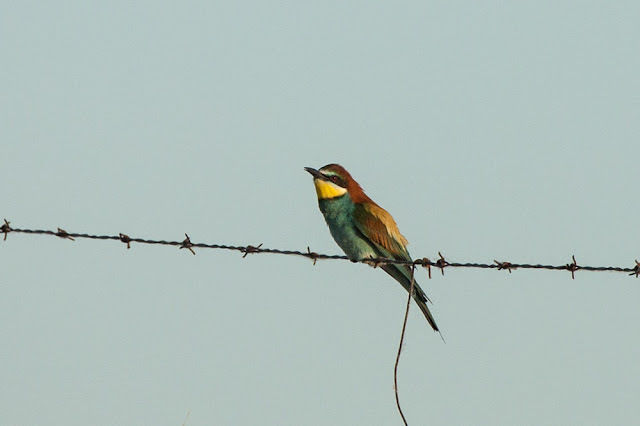 As we drove down the dirt road, we got our first great looks at European Bee-eater, which is a stunning bird! All along the road, larks flew up and perched on the fences. It took awhile to get used to identifying them but by the end of the morning, I was getting the hang of it and had seen five lark species. The European Bee-eater is quite a spectacular bird! Crested Larks were the most numerous lark in the Santa Marta steppe. 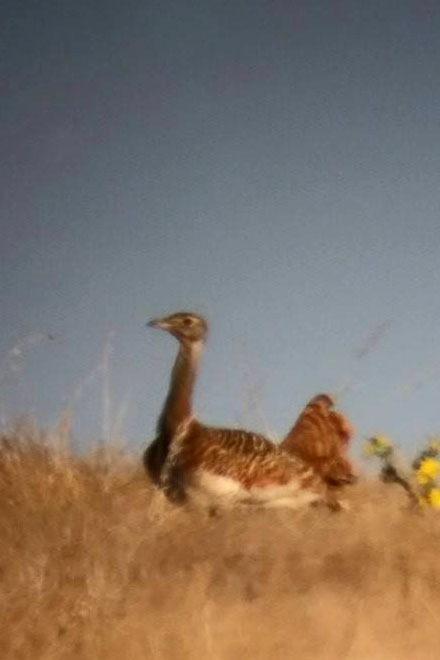 It was starting to look like we might not find a bustard that morning but I decided to take one more scan of the surrounding fields with my scope and boy was I glad I did! After seeing four Great Bustards at a distance, I turned around to put my scope in the car only to find two much closer on the other side of the road. 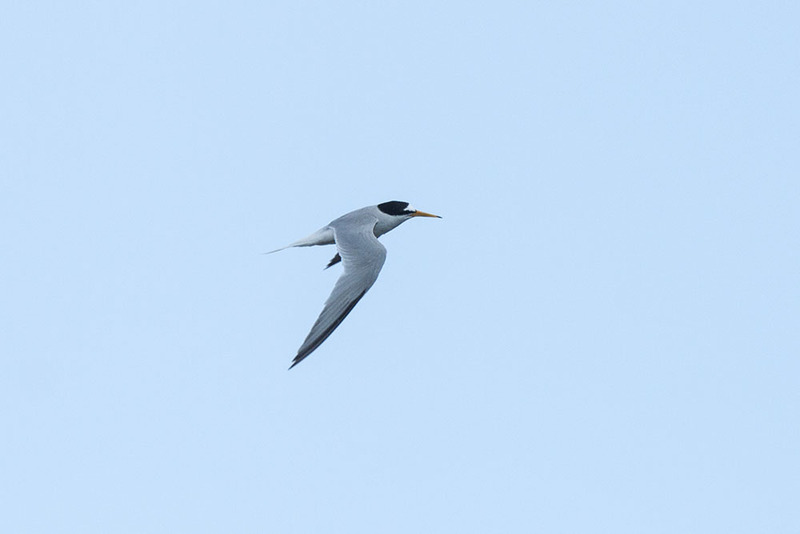 the digiscoped shots didn't turn out as well. After breakfast, we continued to explore the plains and found many more lifers including European Roller, Montague's Harrier, and Cirl Bunting. For lunch, we explored the historic city of Cácares. 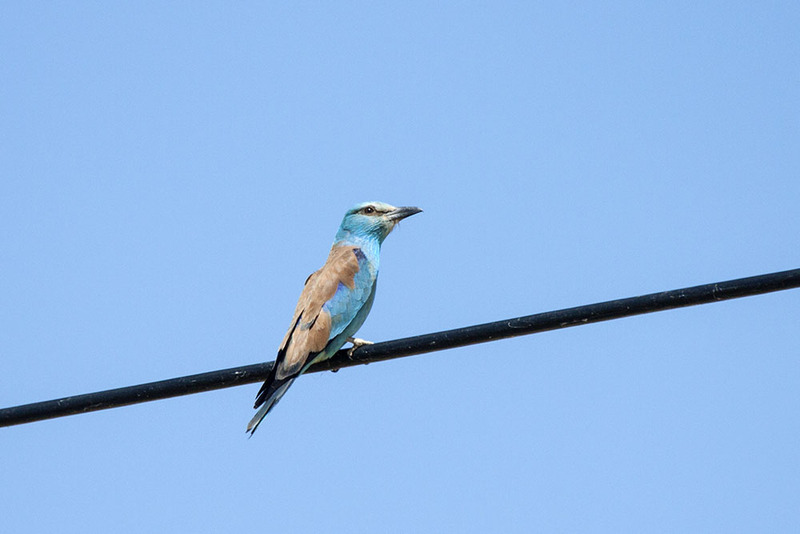 The European Roller was one of the more colorful birds that we saw on our whole trip. Another target species for me was Collared Pranticole so after lunch, we set off for a local reservoir where Martin from Casa Rural El Recuardo had seen them recently. The reservoir turnout out not to just be a great place to see Collared Pranticole but also Little Tern, Black-winged Avocet, loads of Great Crested Grebes, and Eurasian Spoonbill. On the way out of the reservoir, a family of Red-legged Partridges hurried across the road. 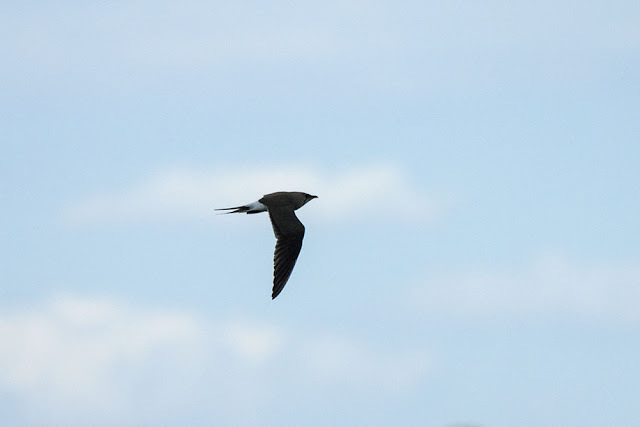 The Collared Pranticole looks like a combination of a shorebird and a swallow! We spent our final evening on a hillside near our hotel waiting for Red-necked Nightjars to come out. It took a long time but they finally emerged giving me my final lifer of the day as well as a spectacular sunset.